We know that between lessons, work, exercise, kids, and husbands- your time is pretty much spent. Come and make one of these fun "Make a Wish" 2-page birthday layouts with Tami on Monday April 6th. Class/or kit includes all supplies for only $20. You will need to bring your own adhesives and scissors. This beautiful set of three wood bunnies makes a perfect spring or Easter decoration. Their soft colors make them an elegant display for any home. Great Gift Idea. Call Paper Cottage at 888-3966 to order a set for you. Complete kit with paper - $24. Wood only - $18. Bring a colorful element to your birthday celebrations with WISH! These fun letters can be displayed as party centerpieces or mantle decoration. They also look fun and bright on top of a shelf. You're kids and family will love to be spotlighted with these letters on their special day. Class includes all supplies to complete wood letters. This class taught by Nicole and is on Saturday, April 18th at 10am. Call today at 888-3966 to reserve a spot in our class or get a "to go" kit. Only $23! 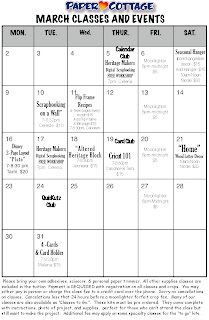 Our ever so popular "Card of the Month" club has completed the 12 card cycle and is starting again. Our first card premiers on Thursday, March 19th. It runs for consecutive 12 months. (March 2009-February of 2010). It is only $15 to join and if you follow all the requirements -you will receive 12 card kits (one per month). Kits are available for pick up the third Thursday of each month or anytime after that- but before the next card is introduced. Each kit comes complete with color photo of project and instructions plus some of the basic supplies. (Kits usually do not include all the supplies - such as some embellishments.) Often we introduce new tools and techniques for you to demo at the store or try on your own. It is a FUN club to join - packed full of ideas and inspiration to last the entire year. This first card below is our card of the month for March. The second card is our bonus card. If you are one of the first 100 people to join - you will get the bonus kit for FREE! Retail value is over $5! Here is a peak of our March and April Basic Grey Page of the Month kits. These to-go-kits retail for only $20 but are packed full of product worth well over that. What a bargain! Quantities are limited so hurry in to claim yours. Kits come complete with color photo of project and instructions. The theme for March is: "it's just a day in my life." See photo above. And April's layout is below. The page layout theme is: "the things i do"
If you are looking for something new, its here! We are so excited to introduce Bella BLVD. This is a brand new company and it is fabulous! Here are just a few samples we found at show. If you want instructions for this Cupcake Mini Album click here to check out Bella BLVD's Bogor for more inspiration you can visit their Idea Gallery. Don't miss your chance to pick up these hot new papers. Supplies are not going to last long. 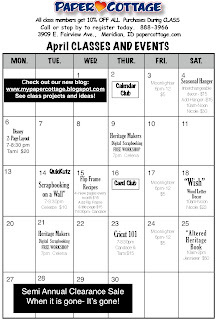 Click on our March and April calendars to see what is happening at Paper Cottage. We would love for you to come to one of our classes! Are you looking for something to chase those winter blahs away? How about a home decor class with Nicole. Our "HOME" wood letter decor class is this Saturday March 21st at 10am. This class is only $23! If you can't make it, be sure to order your kit-to-go. Sign up today so Nicole can get your wood cut and your kit ready. Our new April Seasonal Hanger is all about Easter and Spring with it's soft colors and jewel embellishments You can almost smell the season! This class is filling up very quickly so please call today to sign up. Each month Nicole offers a new seasonal or holiday hanger. New products keep coming in daily. We have the sweetest baby line for you! The Baby Safari collection from Little Yellow Bicycle is a playful menagerie of jungle animals and offers up just the right amount of cuteness and charm. Check out these irresistible ideas. Attention all Quickutz lovers! Candace our very own Paper Cottage QuicKutz Queen has created a blog to keep you updated with all the latest and greatest happenings with QuicKutz and Paper Cottage. Click on to her link and at it to your favorites. Scor-Pals - Score like never before! Scor-pals are here but they will go fast. Come in now and get yours. The Scor-Pal creates accurate and precise scores giving you professional looking folds. No more crooked cards. You can even create multiple scores in seconds without moving your paper. Perfect for accordion folds, boxes, fancy folds cars and other exciting projects. Want some fun spring ideas to use your Scor-Pal with? Check out this link, these projects are perfect for spring. 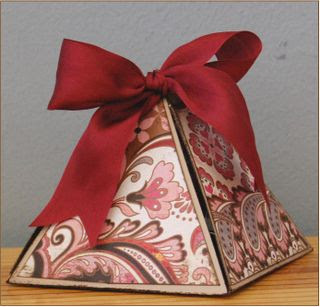 Or check out this fun pyramid box below. We have everything you need at Paper Cottage to create this and other fun paper crafting projects. You can click and print the tutorial that will walk you through each step to make the box base. Don’t get overwhelmed when you first read the instructions. It is very simple to make if you just take it one step at a time. *It is not necessary to build all of the layers of the exploding box unless you want to. This box would be fun to decorate with some of our new Spring papers and give to your favorite friends for Easter! 2. Once you have completed the box base, you can cut patterned paper to decorate the outside of the box. 3. Fill with a yummy treat and give to a friend or loved one.